It was a very long off season and June 27th couldn't come quick enough for us in New England waiting for our first and only air show. The line up this year looked very impressive with 2 Major Demo teams in the Canadian Snowbirds and the US Navy's Blue Angels. The F-16 Viper East team and the F-22 Raptor team were on hand for both days of full demo's as well as the P-51 Horseman duo which completed the Heritage Flight nicely. Saturday we were blessed by the Air Show Gods, where it seemed like a lot of air shows this summer were either washed out or had to deal with major rain Rhode Island was dealt Sunny, Blue dry skies. The morning jump was handled by the Black Daggers using the C-23 Sherpa as their jump ship at 12000 ft. Sean Tucker and the P-51's took to the sky once the Daggers had reached the ground. The Mustangs flown by Ed Shipley and Ed Beasley performed a 2 ship ballet over Quonset Pt. Next to center stage was John Klatt in his Staudacher S-300D, John is also an active F-16 pilot for the MN Air National Guard. One of the highlights for me was up next, the full Raptor demo! Last year the Raptor made a flight up from Langley AFB to perform a short demo. This year we got the F-22 twice on Saturday and were not let down. The manuevers this plane can make is awe inspiring. Not to be out done, the East Coast Viper team from Shaw AFB was ready to show what the mighty little F-16 can do. 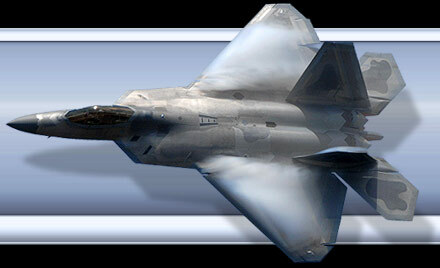 Piloted by Maj. George "Dog" Clifford who seemed to perform his entire demo in afterburner. I had the pleasure on Friday's practice to be on the ramp to capture the preflight checks of the East Coast Viper team which was awesome. Mike Goulian took flight in his Extra 330SC for an impressive acrobatic flight with twists and turns though out the sky. The P-51's had gone back up with the F-22 and F-16 for the Heritage Flight fly by. Following the Heritage Flight were the Canadian Snowbirds with their 9 ship aerial ballet. They might not have the speed of their American counterparts but they don't lack the finesse that those groups show! Sean Tucker had gone back up for another demo where he cuts 3 separate ribbons at the tops of poles which were being held by volunteers from the crowd. Next up is the always crowd pleasing Combined Arms Demo. This year showed the return of the A-10's since BRAC removed New England's two units. The 103rd FS from PA came up and used one of their A-10s along with 2 C-130J's, a C-23 Sherpa, 3 UH-60 Blackhawks and a UH-1 Huey all of the Rhode Island Air and Army National guard, all based here at Quonset. The only thing missing was the Wall of Fire. Now for the Headliners. Fat Albert was up next, the C-130T transport aircraft used by the Marines carries the support personnel for the Blue Angels. Normally preforming a JATO take off, with the lack of rocket bottles the Blue Angels had to restrict the number of shows they preform this maneuver at. "Bert", still preforms some high speed passes and ends his show with their high angle landing to demonstrate how they would enter a high thread landing zone. The Blues took field next, with 4 taxing to one end while the two solo's taxied to the opposing end of the runway. Blue Angel 6 who after take off stays low and flight passed the end of the runway and pulls back blowing a large cloud of dust into the air. Once all in the air the Blue's perform 4 ship maneuvers while the 2 solos usually fly opposing passes crossing at show center. Then the 6 aircraft form up for Diamond and 6 abreast formations. 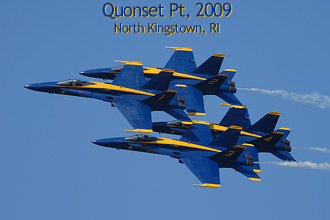 It was another great show flown by teh Blue Angels at Quonset Pt, Rhode Island. I would like to thank the 143rd AW and the RI ANG PAO Lt Col. Riel for all their hospitality at this years show. Thanks again to Viper East Team for allowing me on the ramp with the team.